The Austin Life: I am a MARATHONER! As of yesterday, about 10:55am, I am a marathoner, finishing my first full marathon! Goals. Okay, I knew I was setting some lofty goals. First it was 1 hr and 40 minutes, in order to qualify for the Boston Marathon. Doable? Probably. But, for the first marathon, probably not. Additionally, I ran injured for a few weeks and my training suffered. And, on all my long runs, I had difficulty keeping my blood sugars up and usually became sick shortly after finishing. I knew the blood sugar thing was going to be an issue, and I was unfortunately correct. From mile 1-mile 11, I was rocking the thing, running under or right at 8 minute miles. My body felt great. I ran following a couple of guys that were running together and looked as though they knew what they were doing. At mile 11, I felt a wave of nausea fall over my body and I knew my sugars were dropping. I had been eating starting at mile 5. I eat cliff chews, jelly beans and gummy bears. I drank water at every water station without difficulty. What was I doing wrong. If I was doing the half, I would have fought through and perhaps beat my personal record from last time. But, I walked a bit and slowed my pace. I was sick. Crossing by the stadium where the half marathoners were finishing and keeping going was very tough. I felt awful, but I knew I would kick myself if I didn't at least try. My mile times dropped to 9 minute miles (which is not good for me) and even made a potty stop (which was perhaps unnecessary but I needed a break more than anything). It was so hard to keep going when I didn't know for sure where I was going, how much farther until the turn around by the lake, and how could I keep myself from vomiting? At every water station, I would slow and walk through them, taking a cup of water to splash on myself, a cup of water to drink, and a cup of ice to chew until the next water station. I took my share of orange slices in hopes that they would help (but they did not). 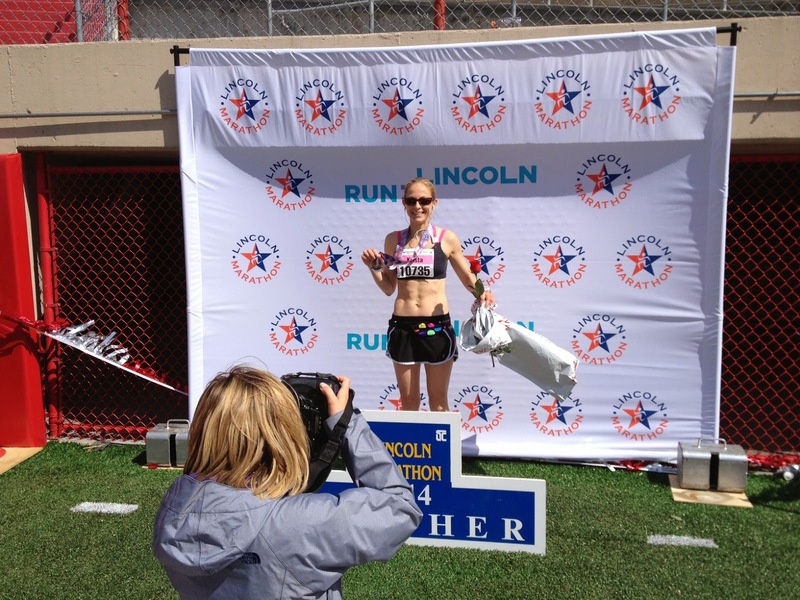 I have to say, the Lincoln Marathon crew is AMAZING! I would start walking and a biker would be there asking if I needed anything. I said I was low on sugar and they provided me with something. They were great! Chris, my lone cheerleader, saw the hazards in the busy intersections since the city did not close the streets. He saw many near misses with runners and with cars. I'm lucky I did not see any of that. I just kept one foot in front of the other. As the stadium neared, I just wanted to finish in under 4 hours. Seriously, I practically walked into the stadium. I was so sick. The 3 hr and 40 minute pacer (clearly much behind pace) ran up and grabbed me and told me to get going...we are almost there. I started to run and kick it through the finish, at 3 hr and 55 minutes (my half time was 1 hr 46 minutes). I stopped, happy it was over. Where or where is that thing they call runner's high? A guy handing out the warming "blankets" agreed to take my picture for me and send it to Chris, who was no where to be found. I walked through the tunnel of memorial stadium grabbing some of the supplied food that I thought I could swallow. I walked out to a crowd of people awaiting their family. I had no idea where Chris said to meet and I was not about to walk any place. I sat on the curb and asked some random stranger to use his phone. He dialed Chris on his sweet looking phone and Chris soon spotted me (Chris still wanted me to walk to him!). After a quick picture from Chris, and I slammed a banana, we were off. I got on Chris' bike to make the hike back to the hotel (We stayed at the Hilton Garden Inn. It was a nice, clean hotel. But, it was expensive. I told Chris that it was the price to pay out of necessity. He soon realized what I meant). I knew I had a short period of time between the finish and when I would start vomiting. Once that happened, I knew I would be a total mess and had no idea how I would get back to the hotel. I glided on Chris' bike ahead of him, stopping and sitting on benches to wait for him to catch up. I could tell, he was very annoyed that I was not waiting for him, but he had no idea how much I was suffering. We got back to the hotel, taking his bike and all up to the room. As we stepped off the elevator onto the 4th floor, the wave hit me. My time had run out. We got back to the room and I collapsed in bed, thanking myself for asking for a later check out (1:30 instead 12). I jumped between the bed and the bathroom for a while. It was coming from all ends at the same time! I was so sick. After vomiting a while, I tried to jump into the shower and see if that helped. It was amazing while I was in there, but I got up and went back to going to bathroom and vomiting and laying on a towel on the hotel bathroom floor. I was a serious mess. As 1pm approached, I knew we had to get going. I told Chris he would have to load up because as soon as I sat up I got dizzy and nauseous. Chris loaded the car, check out and I sat out front to wait for him to come around from the parking garage. I laid in the car trying to get comfortable. About half way home, another wave of nausea came over me and I was lucky to have a Panera bag to get sick into. Poor Chris. He did not say a word to me. I was just a mess. Once at home, I dropped everything and went to bed until 4pm. When I woke, I felt much better. I had Chris order me my reward pizza where I did my best to eat a couple slices and drink a lot of water. I felt better but weird all night. The kids elected to stay at my parents. They had a blast on the farm. I am thankful they went with them because I was in no shape to be a Mommy after my run. My parents rock! The girls in Grandma's bath tub. Enough bubbles you think? The goal was achieved, to finish a marathon. Now, what is my next goal? I don't know. For starters, I have to survive 5 12 hour night shifts this week. That may be worse than the marathon! * More pics to come! How I started out running. It was a cold start. But, once I started running, I never noticed the cold. It's Jill.....I did go to mile 16 to cheer on the marathoners but I missed you! Be proud!!!! You did it!! !